Hi, I'm Lacie! I'm a real mom with a crazy busy life. I'm always seeking new ways to make things easier. I hope my ideas can help make your life a little easier too! Thanks for stopping by! Buffalo Chicken Taquitos For The Win! This deliciously sweet Broccoli Cauliflower Salad is the perfect addition to any potluck, holiday, family gathering, or cookout. You guys are gonna love it. It’s a little sweet and a little salty from the bacon and it is oh so good. Hey folks! I hope y’all had an amazing holiday weekend. I know I sure did. My family and I got to spend time with my lifelong friend and her family and it was fabulous. 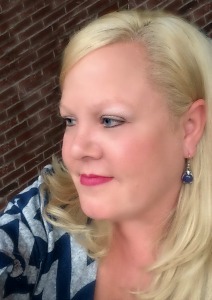 (You may recall my dear friend Jessica from a post I wrote last year. We made the cutest sign to announce her pregnancy.) While I was there, I picked up some great new recipes to share with you all. 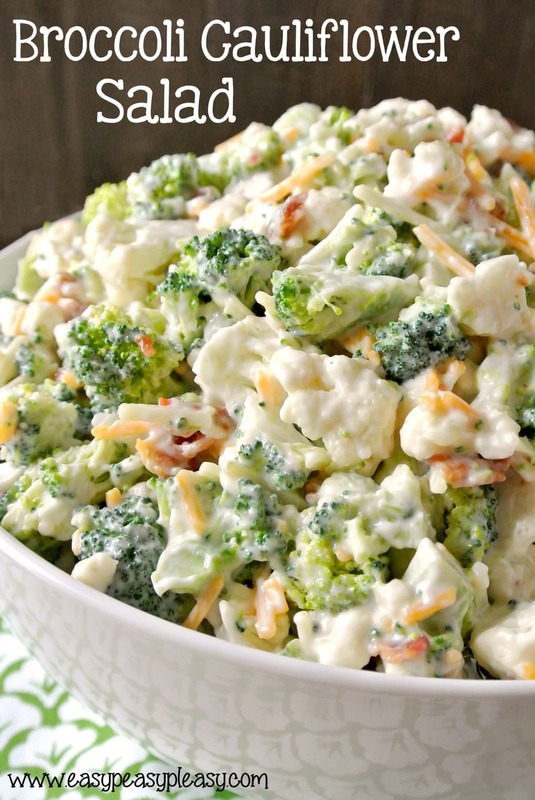 First on the list is this deliciously sweet Broccoli Cauliflower Salad. This salad really takes no time to make. I turn the oven to 400 degrees and place the bacon on a foil lined baking sheet. I immediately place the bacon in the oven even while it’s preheating. Set the timer for 20 minutes and prepare the rest. I have everything all done and ready to go when the bacon comes out of the oven. Twenty minutes is all it takes. This Broccoli Cauliflower Salad is super easy, tangy sweet and delicious. Jess and I always swap recipes. I remember her saying, she makes this salad when she wants something sweet and makes my Bacon Cauliflower Salad when she wants something savory. You should try both. They are both equally delicious and totally different! You can easily cut this salad in half for a family weeknight dinner. 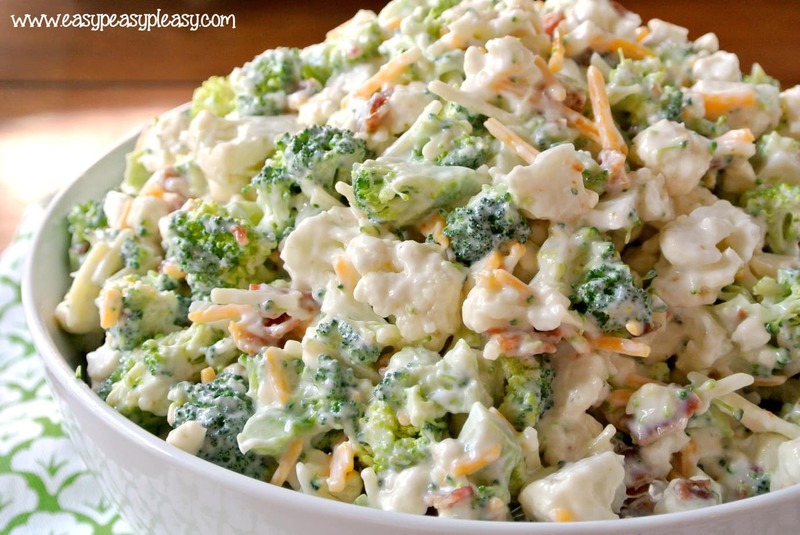 If you are wanting to make this salad the day before, keep the broccoli mixture separate from the mayo mixture (in the fridge) until you are ready to serve. I prefer fresh cooked bacon but Jessie says she uses bacon bits in a pinch. The real bacon bits, not those red imitation things. You can’t go wrong getting in those veggies when it’s made this way. Big huge thank you to my girlfriend Jessie for letting me share her recipe. I love it! Love you girl! Mix broccoli, cauliflower, bacon, and shredded cheese in a large bowl. In a small bowl, mix mayonnaise, sour cream, sugar, and salt until well combined. Pour mayonnaise mixture over broccoli mixture and stir until well incorporated. Eat immediately or chill until ready to serve. Simplify your life with Easy Peasy Pleasy. Sign up below. Be the first to get all my easy recipes, easy DIY ideas, fun inspiration, and tips to make it all easier by signing up below. *Don't worry, your email is safe with me! I can’t have sour cream. Any suggestions for substitutes? The salad looks delicious and I’d like to try it. Hi Michelle! Great question. I would go all in with the mayo. You could try plain Greek yogurt too. Hi Michelle! Great question. I would definitely use mayo in place of the sour cream. It will still be equally as delicious. Thank you for stopping by! If you can’t have dairy, how about an olive oil vinaigrette? Or tahini dressing would give it a creamy texture and a wonderful flavor. If you can have dairy, Greek yogurt would be great on this. This looks great! I could this all day I think!Thanks for linking up to Merry Monday! Pinned ! Have a great week! Hi Kim! I ate it everyday for a week after taking the photos! I wasn’t complaint one bit! Is the broccoli cooked at all? No cooking required for the broccoli. can you use sweet and low or splenda in place of the sugar? Hi Susan. I wouldn’t use sweet and low for sure because that artificial flavor will be prominent. I not really sure I would use Splenda either. If you give it a try, let me know how it turns out. Could you use miracle whip instead of the sugar and sour cream? Hi Janet! Great question. The best part about this recipe is you can taste as you go. I’ve never used Miracle Whip and it does lend a different flavor than mayo so that’s up to your discretion. I think you may still need the sour cream and some sugar. You can always taste and add those 2 ingredients until you get the flavor you love. Just keep taste testing. Thank you! Will let you know. Maybe i wont use the whole 1/2 cup. Can you tell us how it came out with less sugar? And how much did you end up using? Can you use frozen broccoli and cauliflower? I’m not finding any good fresh stuff in the stores. I have frozen steamer bags of broccoli and cauliflower that I’m wondering will work. Hi Heather! Great question. No you can’t use the frozen stuff. There is to much water when it’s frozen plus you want the nice crunch of fresh in this dish. Those steamer bags have been cooked already as well. I hope that helps. ???? Thanks so much! Will find fresh veggies. What happens if you make it the day before and don’t separate the mayo mixture? The mayo mixture gets runny and doesn’t stick to the veggies as well. This is one of my favorite and most requested salad. I like it better 2 or 3 days later, too. Debbie…to be honest, I don’t know. I always make this recipe to feed a crowd. Family gatherings and potlucks. Just wondering if you can get away with less sugar? ???? Hi Belinda. I’m sure you could use less sugar. I would mix up the mayo mixture and add the sugar amount you want and give it taste. Your taste buds will let you know. ???? Hey Cathy! I love red onion…great idea! I haven’t tried it with Miracle Whip. Please let us know how it taste if you give it a go. I always use half the sugar on this and all recipes. Also I like to put a little bit of grated onion into this salad. Makes it better to me. I am making this tonight and am going to add some frozen peas! Hey Ellie! That’s what it’s all about! You be you and customize the way you like. Are the broccoli and cauliflower cooked?? Hey Jazmin! No the veggies are not cooked. This is a cold salad. To receive all things Easy Peasy right to your inbox .